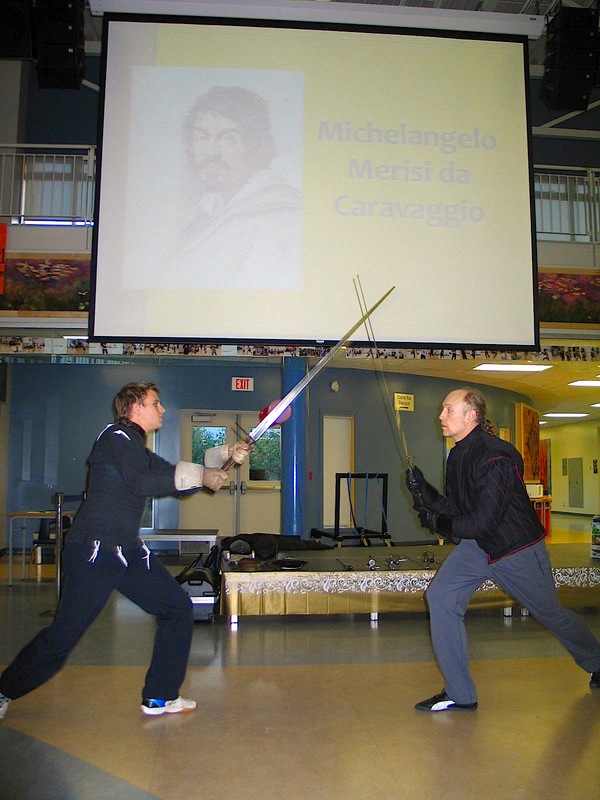 My interview with Devon Boorman, director and co-founder of Academie Duello, a school of Swordplay and Western Martial Arts devoted to teaching the traditional martial practices of Europe. 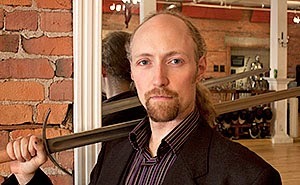 Come meet Devon when he conducts a sword-fighting workshop at my booklaunch, November 7. MDS: First and most obvious question for everybody: Western Martial Artist vs. Ninja: who wins? DB: Not fair. Ninjas are invisible. MDS: O...kay. Growing up, every boy imagines himself a sword fighter, but did you imagine you'd be doing this for a living? DB: I was born in Trail, BC but grew up in the lower mainland. I certainly was a boy who imagined himself a sword fighte, specifically Robin Hood and Zorro. I loved watching old Zorro reruns and classic Robin Hood movies and I used to emulate their moves and make up my own with a fencing foil my parents had found in the attic of an old house. MDS: Did you ever practice any Eastern Martial Arts? DB: When I was a kid I started with Kung Fu when I was about 7 years old. I also explored Filipino Martial Arts in my teens, but I wanted to do some type of sword fighting or fencing. Eastern Arts always disappointed me because you had to rise so far through the belts before being able to work with swords. I’m more patient now, and enjoy unarmed sparring as much as armed work. MDS: Every time I type “Martial” too quickly, I misspell it as “Marital.” Do you think Academie Duello might someday offer “Western Marital Arts” as well? What would that look like? DB: I think they’d look exactly the same. Every marriage could use a few more conflict resolution skills. MDS: Okay. You've choreographed and consulted for film, television, and stage for years. Who are some of the most noteworthy and interesting people you've been able to work with? DB: Honestly my main focus is on effective combat. A lot of the stage work goes to other members of my team now who are more geared to that area. However, I certainly enjoyed training the stars of Smallville and doubling for Lex Luthor in some early fencing scenes. Beyond that, being on the Bard on the Beach stage both last year and this year in a special co-production based around Shakespearean fighting has been a thrill. MDS: What is your favourite weapon or style among the Western Martial Arts. DB: I have had a long love affair with the rapier, however each aspect of our disciplines carries different qualities I love. Right now I think I’m particularly enjoying sword-and-buckler. MDS: Reading the history page on the Academie Duello website, I was amazed at how the studio has expanded so quickly from such humble beginnings. What do think has been the main catalyst for the growth and popularity? Is this more of a local phenomenon, or is there something in our broader culture that is responsible for people getting into Western Martial Arts? DB: Western Martial Arts are definitely undergoing a renaissance worldwide. 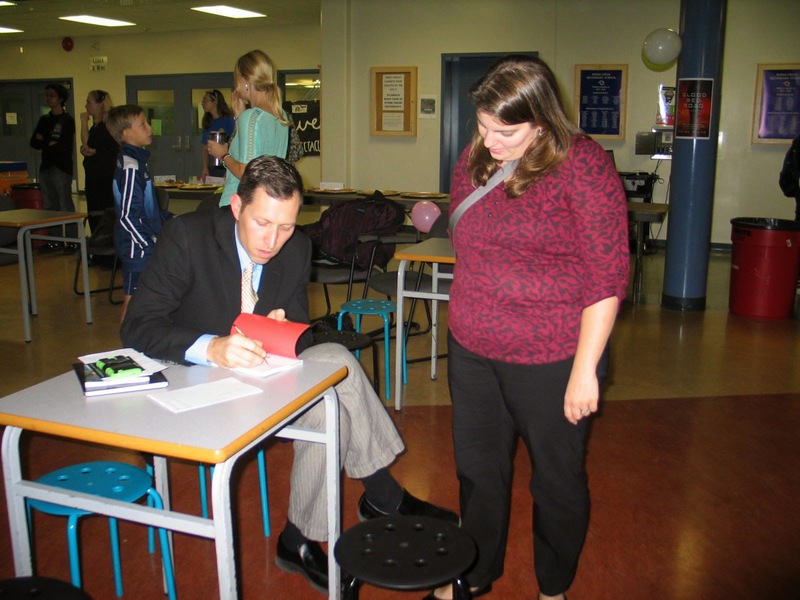 There are growing events and schools in most major cities in North America and Europe. Locally I think the key to our success has been a combination of an exciting martial art and the values that our school represents. We are a welcoming place and we see swordplay as a way to feel empowered and conquer our own personal blocks and barriers. That’s pretty compelling. MDS: Many Martial Arts studios consider self-discipline to be part-and-parcel of fighting skills. What sorts of virtues does Academie Duello try to impart to its students, beyond excellence in technique? DB: Our school motto is Arte, Ardore, Onore. Arte is the italian word for skill and represents our pursuit of mastery—a lifelong journey. Ardore is passion, and speaks to the journey of finding, invigorating, and reinvigorating our passion for this art and other aspects of our life. Many modern people struggle with finding things they’re passionate about; when we find them we often lack the wisdom to understand how to feed and grow those passions—we often expect the passion to be a limitless font of energy and are disappointed when it starts to wane. I want my students to understand that it’s a two-way street. Onore is the Italian word for honour. I think it is important to honour ourselves and the work we put into things, our teachers for investing time into us, and our training partners for putting themselves on the other end of a sword to help us learn. MDS: Ever had any accidents? What was your most memorable? DB: Fortunately swordplay has turned out to be relatively light on accidents. We emphasize control in our training and wear appropriate safety gear during more vigorous activities. My most memorable injury came a couple years ago when I was fighting in an armoured tournament in traditional style (done in full suits of plate armour). My opponent got in close to throw me, and in my attempt at reversal I drew him onto my right side and he fell onto my shoulder; but our weapons were also tangled in between us, causing my spear to lever my shoulder out—a separation. I healed fully but it led to a lot of fun stories at the lunch counter. “How’d you hurt your shoulder?” “A man in a suit of armour fell on it. Don’t worry I stabbed him with a spear twice first.” This was usually followed by a long silence. MDS: You once told me that no description of a sword fight would ever be as interesting as actually being in a sword fight. Having said that, what is the most enjoyable description of a sword fight you've ever read, and what made it so good? DB: I enjoyed CC Humphreys sword fights in Shakespeare’s Rebel. He used a lot of good traditional terminology and yet captured the excitement and challenges, both internal and external, of being in a sword fight—however I consulted on that book so I might be biased!